Last Friday Monty came to my house and he saw all my family. 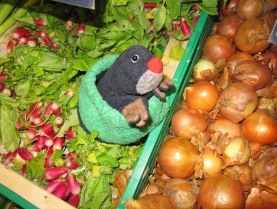 My mum needed something from the market and Monty and I decided to go with her. 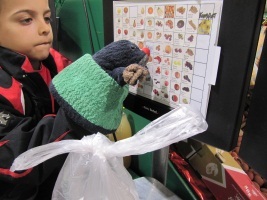 Monty loves vegetables and he got the best ones and put it in the scale and he put the stickers with the price in the bags. 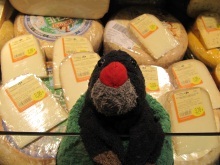 Then he smelted the cheese and he became crazy, “The French cheese is the yummiest one!” He said. 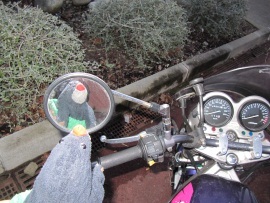 When we went out of the market, there was a motorcycle on the street and Monty wanted to get on it. “No Monty, it is really dangerous” I said. So we decided to get in our car. 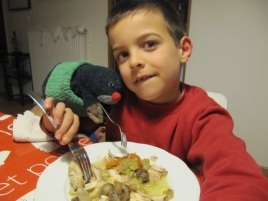 When we arrived at home, we cooked the vegetables that we have bought, and we mixed them with pieces of chicken. Monty was hungry and he ate some pieces of my plate. I don’t care because I like to share with him. At night I was sleeping and Monty woke me up. He wanted to scare me. He did it, but I forgave him and I invited Monty to sleep with me. We had sweet dreams. In the morning it was Monty’s birthday. Gustavo and I put all our cuddly toys with Monty. We gave him a present and we sang “Happy birthday”. I’m notsure that it really was Monty’s birthday, but he loved it. Saturday, we went to a Pirate ship for lunch. 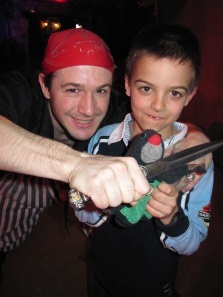 A pirate wanted to get Monty on the ship to eat him. But I saved Monty and then I made a lot of pirates friends. 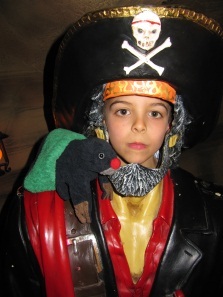 They dressed me up as a pirate, and my pet was Monty (all the famous pirates had a pet). It was an excellent weekend with Monty with a lot of adventures. I really hope Monty comes home again soon. Miguel, well done for looking after Monty so brilliantly. I really enjoyed reading about all your adventures. 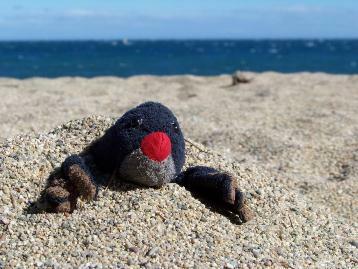 Monty has told me all about the pirate restaurant and he strongly recommends it, so I'll have to pay a visit. I'm glad you enjoyed looking after him. Monty is not sure of the actual date of his birthday but he is happy to celebrate several times a year!! Wow! What a fantastic weekend Miguel. I loved all the weighing he did on the scales although the pirate ship sounded a bit scary to me! Well done for writing so much. I'm going to show Year 6! I wish my weekend had been half as exciting. I only met one pirate on my travels and didn't have a pet as exotic as Monty on his shoulder. I really enjoyed reading your story of the weekend. Well done. Miguel, you were good dressed like a pirate.